HANG ON – CARRY ON en Sink or swim zijn geselecteerd voor het 1st Muestra Internacional Caracas Videodanzada in Venezuela. 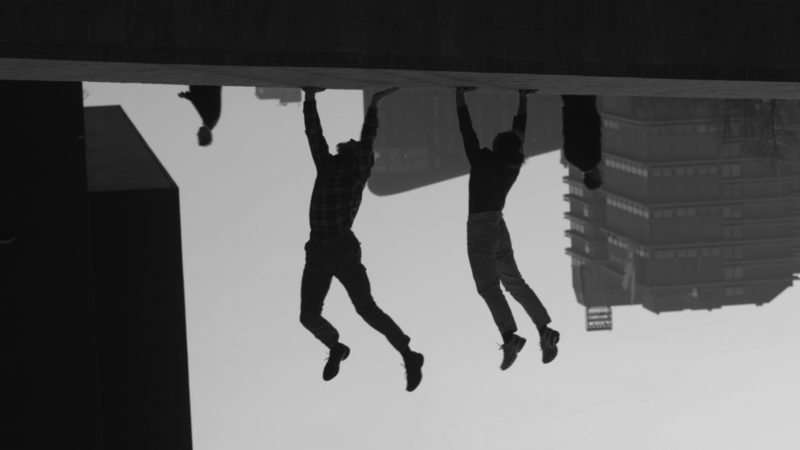 HANG ON – CARRY ON is daarnaast ook te zien op het D’OLHAR Festival in Brazilië en het ATHENS VIDEO DANCE PROJECT waar hij meedoet met een speciale dag over ‘otherness’ in dansfilms. HANG ON – CARRY ON participates in the Just a minute festival. 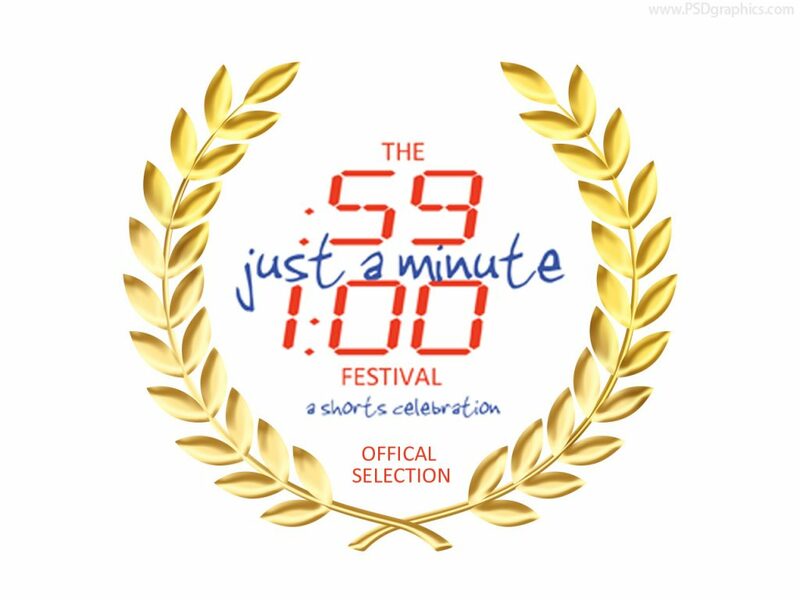 This is an online festival where the audience can vote for one minute films. By voting, you can even win yourself $ 20,-. I guess it’s more a social media contest than a filmfestival but please take a minute to vote at http://www.justaminute.tv/ and watch some very nice films in the mean time! 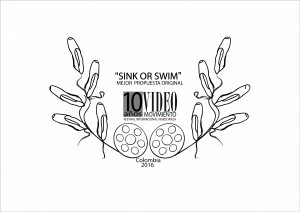 At the 10th ‘festival internacional de videodanza‘ in Colombia, Sink or swim won yet another prize for ‘most original approach’. The film could also be seen at the ‘Breaking 8‘ festival in Cagliari, Italy. HANG ON – CARRY ON will be screened at the Light Moves Festival in Limerick, Ireland, which takes place from November 3rd till the 6th. 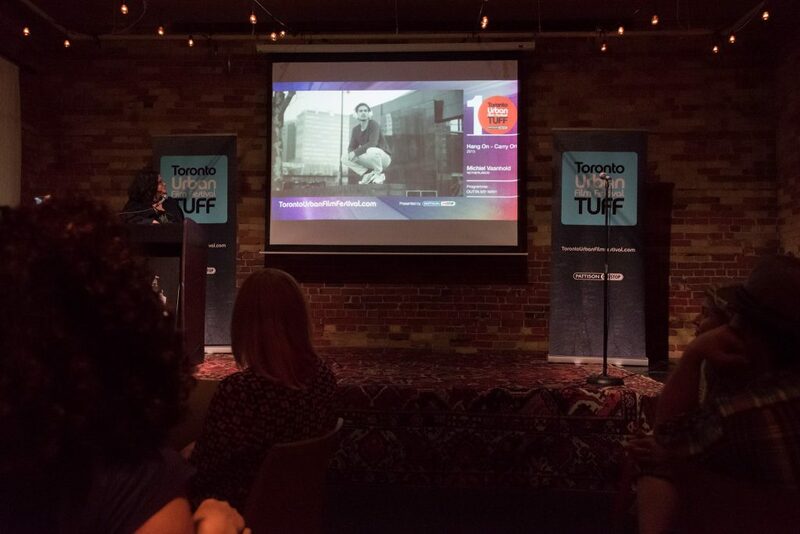 Another win for ‘HANG ON – CARRY ON’, this time in Toronto where it won the ‘Special Jury Award’ at the Toronto Urban Film Festival. The film will continue its tour to the Light moves Festival in Ireland and ‘Moving Images‘ in Cyprus. It’s also touring with the Tangaj Festival in Romenia. 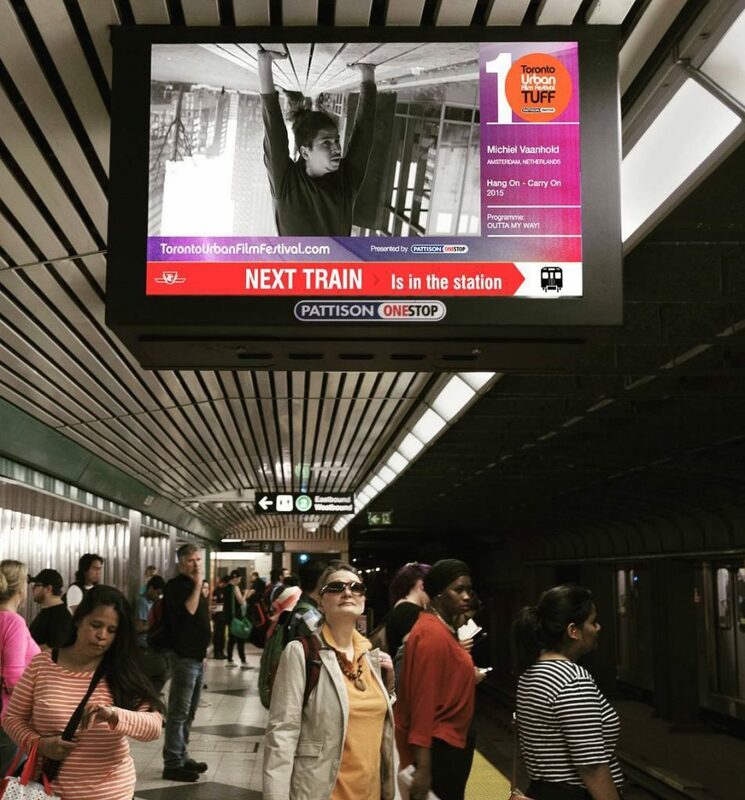 HANG ON – CARRY ON’s world tour continues as it is part of the Toronto Urban Film Festival where it will be screened in different subway stations. The film will also be screened at the Minne Mini Festival in Minnesota and the Staunton International Film Festival in Virginia. Great news: This weekend my dancefilm ‘Sink or swim’ was awarded with the festival award at the Flatlands Dance Film Festival in Illinois! HANG ON CARRY ON is binnenkort te zien op het Light moves festival (3-6 November) in Ierland en het Jumping Frames (4-14 Augustus 2016) festival in Hong Kong. 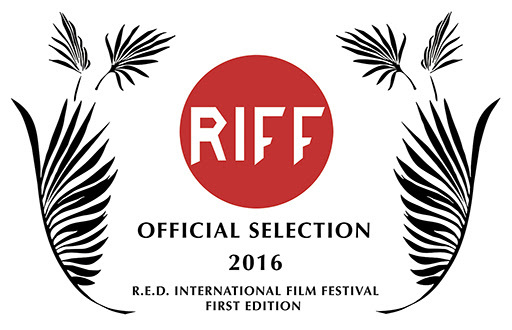 Sink or swim is geselecteerd voor het RIFF-festival (29-31 Juli 2016)in Noorwegen. Beide films zijn ook te zien op het Flatlands Dance Film Festival (26/27 Augustus 2016) in Illinois. This week we were notified that Giulio d’Anna and I can continue developing our filmplan ‘Ballroom Breakdown’. 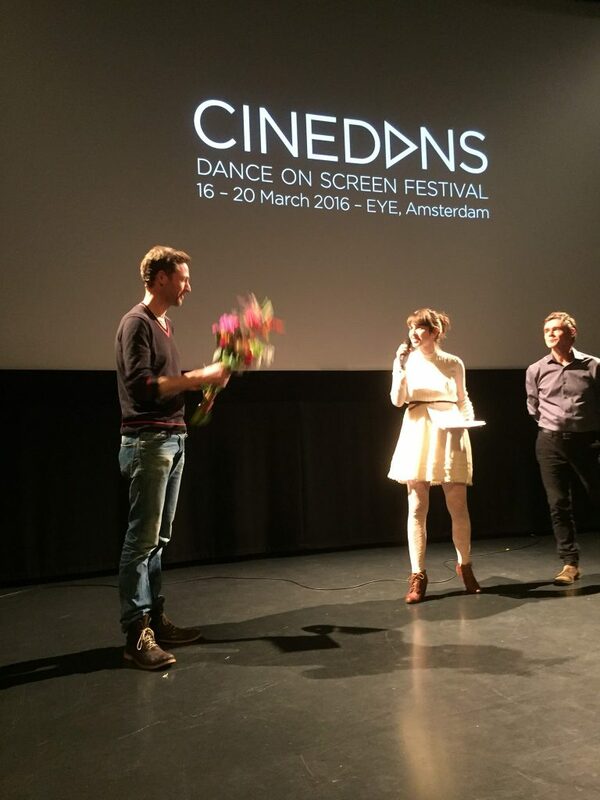 Our plan was selected by the Dutch Filmfund, the Mediafund, Cinedans and the NTR, in the context of ‘de wolf danst’. In September a final selection will be made. Hopefully we will also make the final round so that we can actually start producing. Thank you! On to the next.